Been catching up with your posts and reading all the durian reviews back to back is making me crave for some. Haha. I never knew there were so many variants of durian. All I know is the super mainstream Musang King. I think about durians everyday and I want to eat it everyday. It’s become a bit of an obsession with me during every durian season. It’s nearing the tail end now but there’s always durians around, just had an awesome 5.4 kg Monthong that was sold as a “durian kampung”. Kim Hoo Durian. 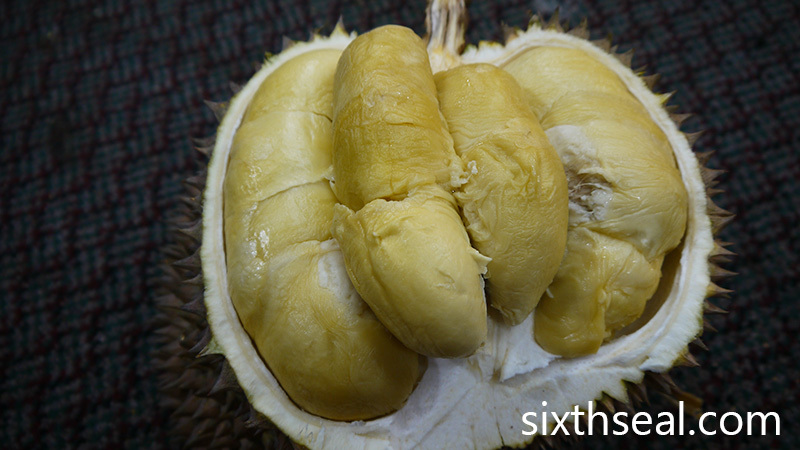 It was one of the durians I had planned to eat when I went to Penang with my better half. 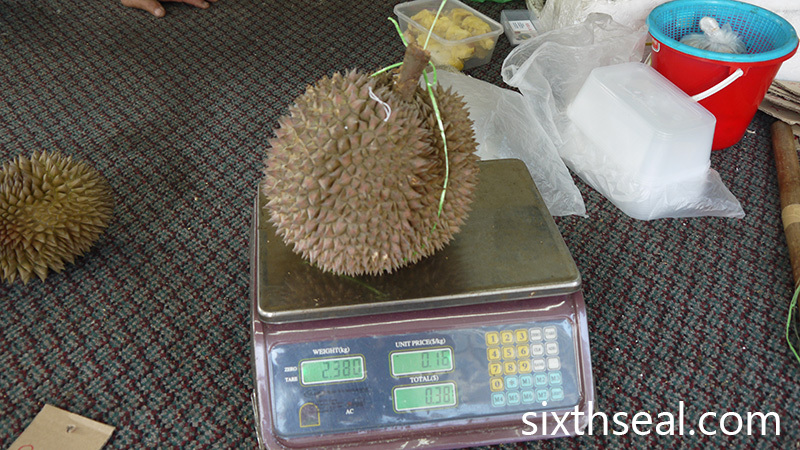 I just had one D159/Monthong sold as “durian kampong” – it was 5.4 kg! Haha! I’ve never heard that phrase before. Maybe that was what the durian was named after, it “cheated” me, that’s for sure. Delicious! We were at Rebellions over the weekend and I wanted to buy some durians for my better half but after we ate (it was maybe 7:30 pm or so?) Ah Seng has already closed up. That means he has sold out, and he usually doesn’t sell out that quickly. There are less durians now, gotta eat em while they’re here. Gosh!!! I am lost! So many different types. They are selling Musang King and another type, D something here in Sibu. RM50 a kg, and 1 kg, you may get about 5 seeds, RM10 each. No, thank you. Wonderful Supermarket right? She asked me on Facebook for durian contacts once and I told her it’ll be hard to get back home since they spoil quickly. I didn’t know she had *already* done it – flown Musang King and D24 back to Sibu via cargo plane. Yup, she’s selling it for around RM 50/kg – the flight transportation costs are high. I would buy them if I were in Sibu and didn’t have access to Musang King – it’s around RM 28/kg here for regular ones and RM 45/kg for highland Musang King. I love Penang durians, they’re really good. They have a lot of durians that we don’t get in KL, and award winning ones too. D175/Red Prawn/Udang Merah is from Penang, so is the recent Black Thorn/Ochee/Duri Hitam. 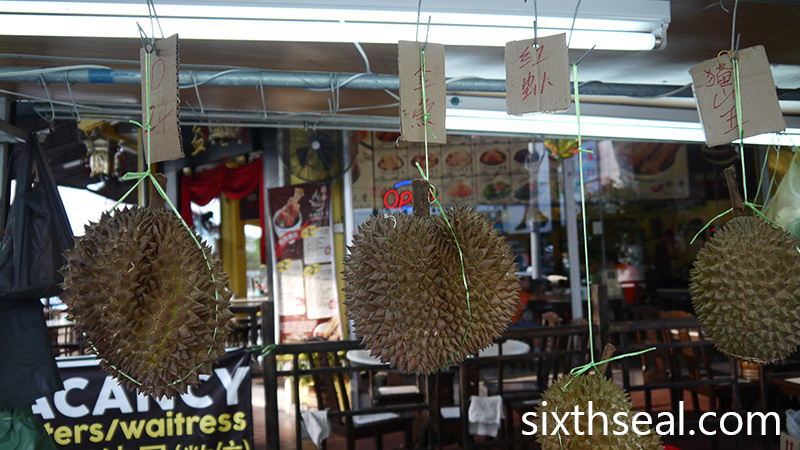 They have some lesser known but good durians like Goldfish, 604, Ling Fong Jiao, Green Skin 15 etc too. I never know there are so many types of durians. You really know durians well, don’t you? That’s just counting the most common durio zibethinus species – the number could be closer to 400 or 500 nowadays with all the hybrids and new cultivars being bred. There are other durian species too, like our lipstick red Borneo jungle durians, I read somewhere that durians are over 700 million years old! More than enough time to evolve into the many delicious species we have nowadays. Is this Kim Hu only sold in Penang? After reading your post, this Sat I must go and eat some durian for lunch since it is the end of the season already. I never heard of such durian before. Maybe only in Penang.